Opera Software released Opera 60, also known as Reborn 3, to the Stable channel of the Opera browser on April 9, 2019. The company aims high with the release stating that it is “setting a new standard for browsers”. Broken down to core changes, Opera 60 launches with a redesigned interface, integration of a crypto wallet and support for making transactions using cryptocurrency. Check out our coverage of Reborn 1 and Reborn 2 If you have missed the first two Reborn waves. 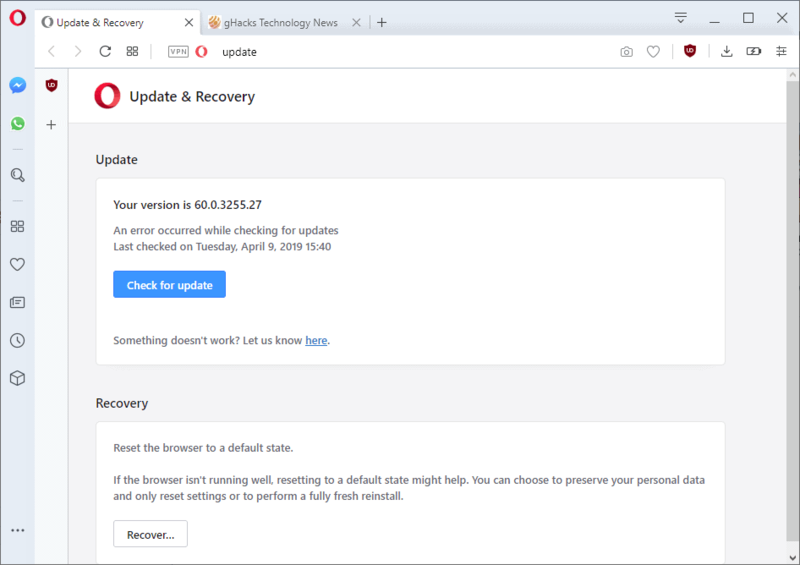 Opera users who run a stable version of the web browser already may open opera://update to run a check for updates. The browser should pick up the new version automatically and install it. Those new or on different channels can download the latest version from the Opera website instead. The new design is the first thing that you will notice on first start. New designs are a tightrope walk as you don’t want to scare existing users away while making sure that the new design is noticeable enough and pleasing to users of the browser. Opera 60 comes with a light and dark theme that users may switch between. We talked about the theme previously when we looked at the update earlier when it launched in the Developer version of Opera. Just load opera://settings in the Opera address bar and toggle the “Enable dark theme” option to switch between light and dark themes in the browser. 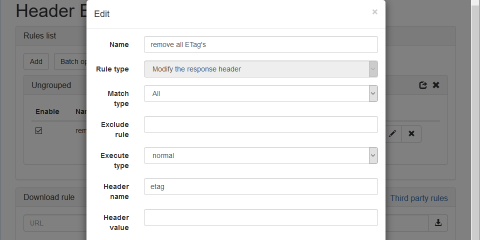 The theme is not revolutionary but veteran Opera users will notice that some items were moved around and that there are some smaller differences like the address bar fading in the toolbar when it is not enabled. Opera 60 supports Web 3 and with it cryptocurrency transactions and a crypto wallet. Support is limited to Ethereum at the time but support for Opera wants to add support for other crypto currencies in future builds. Opera supports so-called dApps, or decentralized applications on the Ethereum blockchain. Opera users need to enable the Crypto Wallet under opera://settings/vpn first; doing so adds a new entry to the sidebar menu. 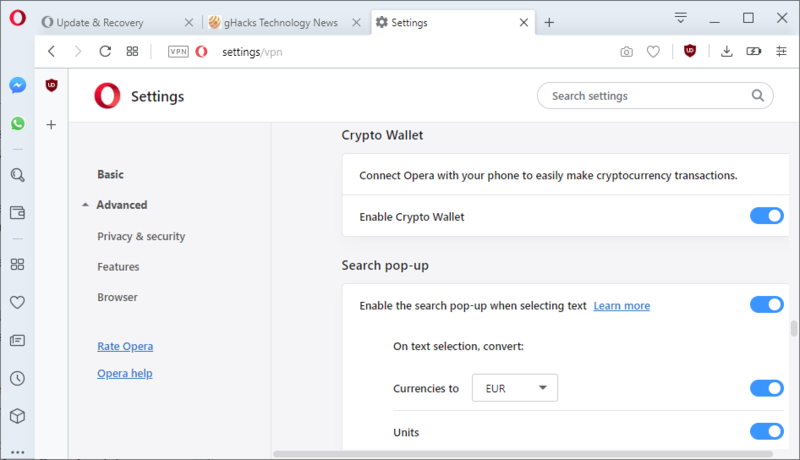 It seems, at least on first glance, that it is necessary to install Opera with Crypto Wallet on Android to link mobile and desktop versions and make cryptocurrency transactions. Seems, because I was not able to test the feature yet. Opera Software highlights the built-in browser VPN and native ad blocker, and launched a Sci-Fi short story that you may watch here. Users interested in the full list of changes can check out the official changelog of Opera 60. Support for dark mode on Windows 10. Now You: Have you tried the new Opera already? What is your take? Ghacks needs you. You can find out how to support us here or support the site directly by becoming a Patreon. Thank you for being a Ghacks reader. The post Opera 60 (Reborn 3) launches appeared first on gHacks Technology News.